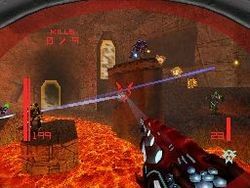 Trace's HUD with the Judicator equipped. The Judicator is found in only Metroid Prime Hunters and it is a weapon of bounty hunter Noxus and is also used by Samus Aran. The weapon uses Plasma at a sub zero temperature. Samus obtains the Judicator at Arcterra. This weapon uses the Universal Ammo. The Judicater on Samus Aran turns her arm cannon "energy streaks" purple and on Noxus it just keeps the cannon the same color. When fired a purple streak of plasma is fired and ricochets off of surfaces untill it either hits an enemy or the plasma loses energy and disintegrates into nothing. The only difference from Samus Aran and Noxus's versions are that when Samus charges up the Judicator and she fires it fires three bullets at once, while with Noxus it makes a short range ice wall that freezes anything in its path. This page was last edited on 11 August 2015, at 19:04.